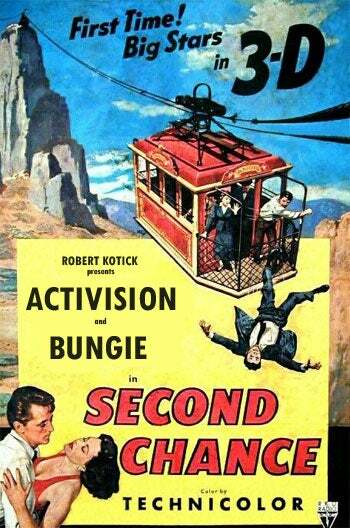 So, Halo creators Bungie are working with Activision on a new piece of IP. For the next ten years. I hope for everyone's sake it's not a first-person shooter! For Bungie's sake, this is because the team has already released a first-person shooter. Lots of them. In fact, between marathon and Halo it's all the studio has been doing for over fifteen years. But Bungie didn't always make first-person shooters: Myth is a strategy title, while the sadly-forgotten Oni is a pretty decent third-person action game. Mac fans will also remember that, before it was an Xbox shooter, Halo was originally planned as a strategy game. It'd be great to see the company spread its wings and, with a new publisher and a new IP, try a new style of game to go with them. For Activision's sake, it's because the last thing the company (and the market) needed was another studio working on shooters. The publisher has a team working on Singularity. Treyarch is working on a Cold War Call of Duty game. Then there's the remnants of Infinity Ward, who are presumably toiling away in an underground salt mine on what's left of Modern Warfare 3, which we'll assume is the game Activision has slated to appear in 2011. That's quite enough shooters, thank you. Quite enough Call of Duty games too, now you mention it. Here's hoping that this deal will prove a breath of fresh air for both parties (and us! ), giving all involved an opportunity to provide us with a AAA franchise that's neither a Call of Duty game nor another first-person shooter.